Introduction: This note is merely a summary of Saint Teresa of Avila’s great book on Catholic mysticism, The Interior Castle, which was first published in 1588. The Saint herself, a Carmelite nun, was a great mystic, and her personal style of writing demonstrates that she composed The Interior Castle from profound personal experience. 3. God dwells in the soul. A central concept of Teresa’s spirituality is the realization that God is immanent – that is, He dwells within the innermost mansion of the human soul (thus, using Teresa’s image of the castle, He dwells in the seventh mansion). “All harm comes to us from failing to realize that God is near.” For “the Kingdom of God is within you” (Luke 17:21). Teresa recommends practicing this form of prayer for six months to a year, saying that once the “Lord has granted it, you will not exchange it for any treasure.” As a practical matter this exercise is best carried out in a quiet setting and in a prayerful posture. Then, after having recollected yourself, look inwardly and speak with your mind and heart to the infinitely good Father who dwells within (note: above paragraph based primarily on The Way of Perfection). Note: Here we see a fundamental difference between meditation and mental prayer. We meditate using images and symbols, such as meditating on a Gospel scene. In mental prayer, the aim is to bypass mediated, symbolic knowledge and to seek direct contact with God in our soul. Meditation and active recollection are similar to the extent they involve primarily the soul’s own effort in prayer, whereas passive (supernatural) recollection involves God’s own action upon the soul. Thus, when I use the terms interior, mental, mystical or contemplative prayer, I am referring to what Saint Teresa calls the prayers of active and then passive recollection, all in contrast to meditative prayer. However, meditative prayer is still invaluable even when the soul begins to make progress in mental or interior prayer (moreover, meditation can effectively serve as a platform for interior prayer, having ignited a flame through reasoned considerations contained in a book, for example, so that the soul then seeks God inwardly). Recommendation: If you begin the practice of interior prayer (active recollection, it is recommended that you do so in conjunction with a trustworthy and experienced spiritual director, in order to avoid pitfalls along the way. However, a greater reward necessitates a greater love, and the souls in this mansion are still governed by reason: “their love is not yet ardent enough to overwhelm their reason.” They need to learn that “perfection consists not in consolations, but in the increase of love.” These souls have not yet made a “full surrender of their wills to God” (Intro. 12; IC 67). To increase the resoluteness of the soul’s will, God may allow it to experience long periods of aridity in prayer. Teresa tells her nuns not to panic when this happens, for God “knows well” how to test us. Such a test has the effect of making the soul conscious of its misery, to gain a “clearer perception of its shortcomings,” and to realize that it still has strong attractions to “earthly things.” This experience helps the soul to gain “a great deal of humility,” to learn the value of perseverance and suffering, and prepares the soul for the life of mystical prayer which will come in the fourth mansion. 11. THE FOURTH MANSION. Entrance into the fourth mansion marks a significant advancement in the soul’s journey to a greater and more profound intimacy with God. As Teresa states, “the soul is now getting nearer to the place where the King dwells.” The fourth mansion marks the transition from the purgative and active stage of the journey to the illuminative and passive stage. In short, in this mansion the soul is beginning to enter into supernatural prayer as the King (God) takes more direct action to communicate Himself to the soul. Teresa reminds us that the interior world of God is always close hand, and that if we continue to persevere in the practice of prayer, overcoming obstacles, trials and servile fear, a greater, disinterested love of the King will arise in the soul preparing it for the gift of supernatural prayer. If there is one point Teresa wants to make it is this: don’t abandon prayer. In the prayer of supernatural recollection, the soul “involuntarily closes his eyes and desires solitude,” not out of choice but because of God’s action upon the soul. The soul then begins to experience a “temple of solitude” being built around it, “like a hedgehog or a turtle withdrawn into itself. The senses and all external things seem to gradually lose their hold on him, while the soul, on the other hand, regains its lost control.” The soul cannot force this experience on God: it is a pure gift for which praise and thanksgiving is the appropriate response. This type of prayer is a form of contemplation or infused loving – as are the forms of mystical prayer in mansions 4-7. In short, mansions 1-3 correspond first to meditation and then to active recollection; mansions 4-7 correspond to contemplative prayer (or infused prayer). In active recollection we are like a man-made aqueduct that is miles away from the ocean; in contemplation we are tapped directly into the ocean (Saint Teresa’s metaphor). 12. THE FIFTH MANSION. Entering the fifth mansion, the soul is still in the illuminative stage of the journey. There are still “hidden treasures” in the castle. Teresa wonders how she will ever be able to explain the “riches and delights” found in the fifth mansion. She also tells us that many of her nuns make it to the lofty state of prayer found in this mansion. Having experienced the prayer of union, the soul now has the most “vehement desire” for penance, solitude “and for all to know God.” It is overwhelmed for having “merited such a blessing.” The soul is now being prepared for the betrothal to the King which will take place in the sixth mansion. Teresa warns the soul to remain humble, for the “power of hell” is still capable of winning the soul back to sin. The soul is still susceptible to the perils of pride and self-delusion. Self-love must be crushed. The soul must keep her “eyes fixed on the King’s greatness,” and grow in love. “Love is never idle.” The soul must keep advancing. Teresa explains these experiences in significant detail (there are eleven chapters describing the sixth mansion), but cautions the soul not to rely on them for the fear the soul might think too highly of itself or even become delusional. Yet it is in these raptures that the King speaks secretly to the soul and the soul “becomes consumed with desire” for the King, “so clearly conscious is it of the presence of its God.” These ecstatic visits from the King constitute, in essence, an engagement period prior to the spiritual marriage which will take place in the seventh mansion. Mixed in with these ecstatic experiences are terrible times of suffering. In mansion three the King tested the soul’s resolve by subjecting it to a profound period of aridity. Passing this test, the soul moved on to mansion four, entering the illuminative stage and experiencing infused prayer. To enter into mansion seven the soul is going to have to withstand even greater hardships. These hardships include physical illness, depression and persecutions, and even seemingly insignificant trials like backbiting and undeserved praise (Intro. 13). Teresa tells the soul that some of these sufferings are “comparable only with the tortures of hell.” And yet the soul bears it all because of her intense love for the King. Teresa calms the soul by encouraging her not to neglect meditative prayer. The soul is not to restrict itself to contemplative or infused prayer. It is beneficial that the soul meditate on the sacred humanity of Jesus, on the Blessed Virgin Mary, and on the lives of the saints. Teresa is really making a very important philosophical point: that the world of supernatural prayer cannot be separated from the categorical world of time and space. Thus, practicing meditative prayer keeps the soul grounded in reality and protected from delusion. This is a practical warning from Teresa that the soul should not chase after mystical phenomena unless it is firmly rooted in the historical faith of Christianity. The soul in the sixth mansion has been on a roller-coaster ride, experiencing the highs of many phenomenal mystical experiences and the lows of many trials and afflictions. She has proven to her beloved that, like a faithful marriage partner, she will stay with Him in good times and in bad. She has weathered the storm and is ready to enter the peaceful confines of the seventh mansion. The soul “is brought into this mansion by means of an intellectual vision” where the “Most Holy Trinity reveals Itself in all three Persons. Here all three Persons communicate Themselves to the soul and speak to the soul” (IC 209). Teresa is, no doubt, recounting here what she experienced when she entered the seventh mansion. She indicates that in addition to this experience she also was granted a vision of Jesus “in great splendor, beauty and majesty” after receiving communion. Jesus spoke to her at that moment. St. Paul’s exclamation, “I have been crucified with Christ, I live, not I, but Christ lives in me” (Galatians 2:19-20), is illustrative of what has happened to the soul. In fact, Teresa points to Paul as a preeminent example of this total transformation in Christ, for having so completely united himself to the Lord through visions, prayer and contemplation, he was ready to suffer “terrible trials” for the Lord, never remaining idle. Teresa ends her book by reminding her nuns that prayer is not a thing in and of itself, as if for personal enjoyment and to satisfy a quest for mystical phenomena. Rather, prayer is necessary to acquire the strength that makes one fit for service, and to lead souls to God. She also reminds her nuns that humility is the foundation of the interior castle. “Without humility all will be lost” (IC 229, 37). 5) Progress on the spiritual journey is not only possible and desirable, but is also necessary. 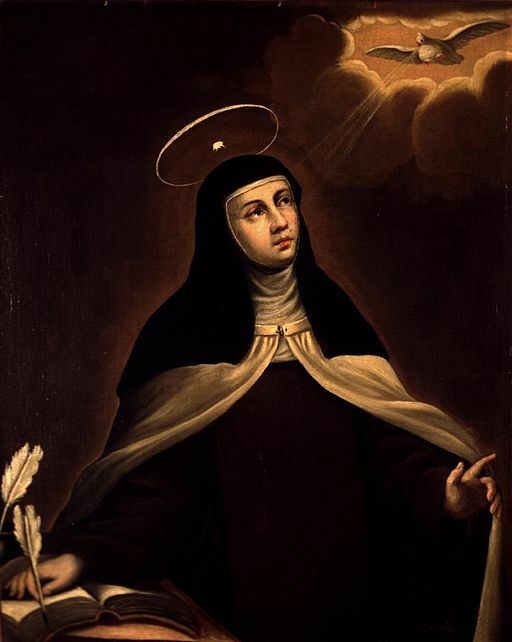 Image: Saint Teresa of Jesus by Alonso del Arco (1635-1704), circa 1700, Public Domain, U.S.A.
References: I am relying primarily on the text of Interior Castle itself, including the Introduction by E. Allison Peers (Image Books); and the essay on Teresa of Avila by Mary E. Giles in Great Thinkers of the Western World (HarperCollins); and The Way of Perfection by Saint Teresa of Avila (Image Books); and Ralph Martin’s audio presentation on Saint Teresa available at renewalministries.net. Regarding 15.4 above, Saint Pope John Paul II wrote, “[Although] the journey is totally sustained by grace, it nonetheless demands an intense spiritual commitment” (NMI 32). am going through troubles with your RSS. I don’t understand why I am unable to join it. What a perfect summary. He helpful. I’m reading IC now and this is guiding me with much clarity. Thanks.